OK… yes, I did. I read through books 1, 2 and 3 AGAIN! I can’t help myself. They’re SOOOO fantastic! And now I have to figure out how to come back down to earth. It is the worst sort of book hangover possible – being forced to deal with reality, when you’ve been enveloped in a world all its’ own… a world that is decidedly not your own. Speculative and Supernatural story-lines are the most difficult because the writer truly does create a different world for you to visit when you pick up the book. Coming back to reality is difficult – or at least, it is when the author is as amazingly talented as K.E. Ganshert! “If science is right, then I am crazy. And crazy is dangerous.” – K.E. Ganshert – Tweet this! As an author myself, I worry that my own worlds are nowhere near as fantastic as hers. While I enjoy being in my own imaginary worlds – it is a very different experience to be able to immerse yourself in someone else’s world. It’s freeing because you don’t know the plot going in. It’s exciting because you don’t know what’s going to happen next. It’s terrifying because you get attached to these people you did not make up – you have no control over what happens to them or where the story takes them… but YOU HAVE TO KNOW! And like so many other series that I have fallen absolutely in love with… I bugged my mum until she read them. She was happy to have all three so she could read them sequentially. And… after reading them, she is just as hooked as I am but for different reasons. The things about this series that appeal to me, that drew me in, that hooked me from the second chapter of book 1 – do not have the same effects on her… not in the same ways and not for the same reasons. “I can’t go home. It’s not safe. Nowhere is.” – K.E. Ganshert – Tweet this! My mother and I do agree on one thing where these books are concerned though, but for totally different reasons… actually that’s not true. Once I explained my reasoning, she agreed 100% with me about it… but she’s still holding on to her reason too. K.E. mentioned in her dedication – that her brother is holding on to the determination that this series of hers will be made into a movie. After reading only two of the books in the series, my mum said the same thing. I agreed and then started to say why I would never watch it – but she presented her reasoning first and then I got distracted by one of the kiddos so I never got around to my reasoning until this morning. My reasoning is this; no matter who the director is… no matter who the actors are… no matter who does the soundtrack (which could ONLY be truly epic if James Horner were still with us) – there is absolutely, positively NO WAY any movie could even begin to compare with the world in my head! And we have both learned this lesson the hard way… many times. No movie is ever as fantastic as the world we build inside our imagination. And sadly… the world loses a little something after we watch a less-than-perfect movie. It is as if something precious has been taken from the vision we have in our mind. It’s a little less… real… to us, than it was before. I DO NOT want that for this series! I pray, fervently, that the series WILL be made into a movie – and when it is, I will encourage a lot of people to go and watch it… especially anyone who needs God in their life! “Darkness is a tricky thing. Especially when it cloaks itself in light.” – K.E. Ganshert – Tweet this! BOOK or MOVIE – DO NOT MISS THIS SERIES! And yes, I’m still laughing hysterically because there are probably a dozen traditional publishers still grinding their teeth in frustration that they missed the chance to make a TON of money off this series! How do I review this book without giving anything away…? How can I go back and read it all over again – for the first time! K.E. Ganshert is an incredibly, amazingly, beautifully gifted author. She writes stories in a way that makes you feel as if you’re living them. She writes worlds as if there is no other. She writes characters in such a way that it feels as though you’re reading yourself – you slip into the character’s skin as easily as you slip into a pool of water. I fully expect to look up and see Rosie sitting across from me with those puppy-dog eyes, begging for the rest of my dinner. But the best thing about this series… Unlike many YA dystopian, speculative and supernatural novels on the market today – it does not erase hope. It does not give us a bleak outlook of a world where we have to lose almost everything to win, or a world where only by stripping us down to almost nothing – can we survive. The Gifting series GIVES us hope! It gives us hope for tomorrow… hope for today… hope for forever. I do not recommend many of the YA series that are so popular today but I feel very strongly that this is a series EVERYONE should read! And by the way… I receive a lot of books free in exchange for an honest review. Not this one – this was a book I purchased. Actually it was pre-ordered for me by my AWESOME mom, because I was so frantic to read it ASAP – which you can see… I have done! And I had to share my opinion with you – my readers! And also laugh hysterically because there are probably a dozen traditional publishers who are grinding their teeth in frustration that they missed the chance to make a TON of money off this series! “How can I go back and read it all over again – for the first time!” – JC Morrows – Tweet this! Darkness is a tricky thing. Especially when it cloaks itself in light. Luka isn’t dead. He’s not beyond saving. Tess knows because she saw him with her own eyes. After what she saw, she’s sure of one thing: If they don’t rescue him soon, Luka won’t be Luka anymore. If only she could convince the other members of the hub. They’re not sure Tess saw what she claims she saw. And they’re preoccupied by the fact that their kind is being systematically eradicated. Answers lie in an ancient prophecy, one that revolves around a seventeen-year-old girl who never asked for any of this. K.E. 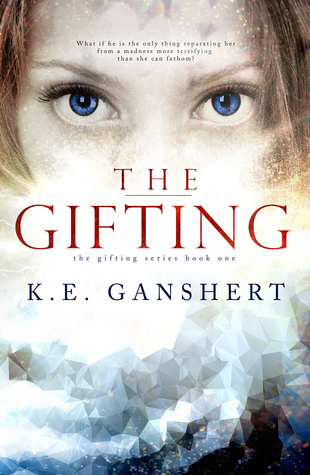 Ganshert’s final installment in The Gifting Series brings readers on an action-packed journey through loss, sacrifice, betrayal, and the impossible choice between what we want most and what we know is right. Darkness is a tricky thing. Especially when it cloaks itself in light. – Tweet this! DO NOT MISS THIS SERIES! 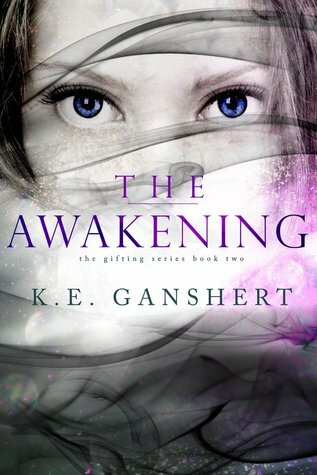 I am going to review BOTH books; The Gifting and The Awakening in this one post because I’m too excited about the series not to! And please excuse the silent scream in the background as I write… TORTURED because I WANT THE NEXT BOOK!!!!!! Never judge a book by it’s synopsis! OH MY WORD! The synopsis doesn’t even begin to scratch the surface of this AMAZING story! Immediately, you want to know what she means. I mean – I know there are crazy people in the world who are dangerous but what exactly is it that makes her crazy and how is it dangerous? For most people, that would be all they need but I have to tell you, at this point, that it took me a long time to decide I should read the book – simply because of the game mentioned in the synopsis. I’m not a fan… well, Tess isn’t either. YAY! Anyway, I SOOOO should have given in and read this long ago – when it first came out. 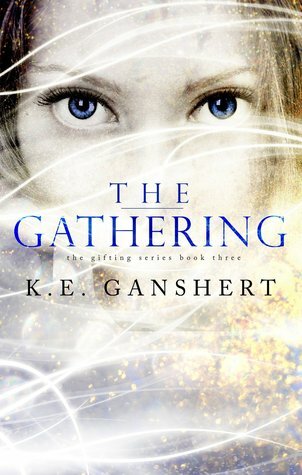 Of course, I would have been absolutely insane waiting a month for the next book… especially considering I have nearly three months until “The Gathering” is available and I’m already going nuts! If you are at all a fan of science fiction, dystopian, fantasy or speculative fiction – this is not a book to miss! Actually, if you enjoy adventure, mystery or magical realism – you would love this book too! It is just an AMAZING book! I simply can’t say it enough! Katie (K.E.) will have you glued to your seat and your nose buried in the story while you’re up to your ears in our heroine’s confusion and devastation! Tess Eckhart has always felt things nobody else can feel. Then the Ouija board incident happens at a high school party. Her complete freakout sends her family across the country—next to a nationally-renowned facility for the mentally ill. Worried that Tess suffers from the same illness that tormented her grandmother, her parents insist she see a psychiatrist. But Tess is more concerned about fitting in at her new school, and hiding the fact that she’s seeing a therapist at the Edward Brooks Facility. She’s used to whispers and stares, but when it comes to Luka Williams, a reluctantly popular boy in her class, she’s unused to a stare that intense. Then the headaches start, and the seemingly prophetic dreams that haunt her at night. As Tess tries to hide them, she becomes increasingly convinced that Luka knows something—that he might somehow be responsible. But what if she’s wrong? What if Luka Williams is the only thing separating her from a madness too terrifying to fathom? First, it was incredibly difficult not to scream at anyone who dared interrupt me while I was reading this book. I ignored my phone. I ignored my e-mail. I ignored everything. Fortunately, my children were happily playing or watching a movie during much of this time. Second, when I reached the end of that last chapter – it was incredibly difficult to make myself do a silent scream – like the one I talked about earlier – which I had to do because everyone else was asleep. DON’T THEY REALIZE how devastating it was! Surely they would have forgiven me. Surely they would have understood. No, I’m sure they would not. They would have groused and told me to get over myself and go to sleep. But the story was over… AND I DIDN’T WANT IT TO BE! Then… third… when Katie (K.E.) teased me with the openings of book 3. The agony of that tiny little peek into a story so immediately intriguing – I could hardly stand to put the book down when I’d reached the end. It was physically painful and it was all I could do not to scream and kick my feet. No, I didn’t remember that I’m too old for tantrums – I remembered how grumpy my family can be when they’re woken up. So I checked my e-mail until I had calmed down enough to sleep. And now I’m chomping at the bit to get the next book… yes, again! I’ve subscribed to K.E.’s Newsletter so that I can’t possibly miss the news! I can’t go home. It’s not safe. Nowhere is. Tess Eckhart isn’t crazy. She’s not suffering from psychosis. She and Luka Williams are part of The Gifting. Before they can find out what that means, the man with all the answers turns up dead. The only thing he left behind? A few patient files that lead to the nation’s most lawless city. With authorities chasing them, Luka and Tess escape into the very heart of peril and against all odds, find an underground community of people just like them. They aren’t gathered together for the sole purpose of survival, either. They have a plan and a purpose–to awaken as many people with The Gifting as possible. It’s dangerous and deadly work. Tess wants to help. Luka is desperate to keep her safe–a task that proves increasingly difficult as Tess’s gifting comes to light. Is Tess Eckhart the One they’ve been waiting for? The One with the power to save them all? Disclaimer: I did NOT receive either of these books free in exchange for an honest review! I (well actually my mum) BOUGHT them both! But I had to share my opinion of two such amazing books with you – my readers!